Sean Brennan’s free kick completed a second-half comeback as Drogheda United drew 2-2 with Galway United at United Park on Friday evening. Galway had taken a deserved 2-0 lead into the break thanks to Eoin McCormack’s header and Conor Barry’s deflected strike, before Mark Doyle pulled one back early in the second half. The Tribesmen’s player manager Alan Murphy had said prior to the match that Galway would “bring the game” to Drogheda and they did just that from the off. Galway had the first two efforts of the game inside five minutes, both through Conor Barry as he twice stung the hands of Paul Skinner from around 25 yards with low efforts. 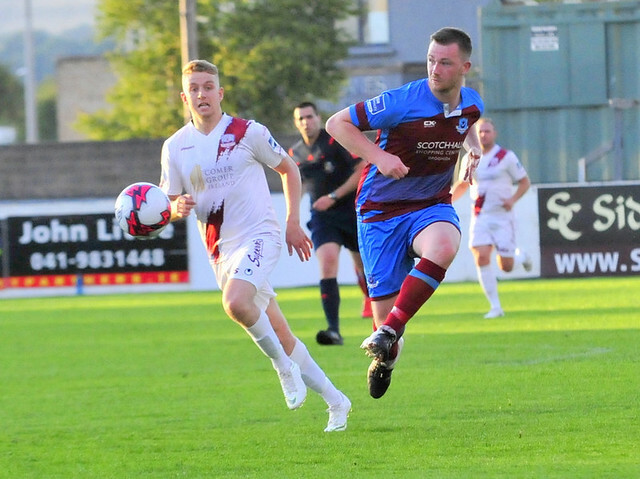 Drogheda’s first chance came on seven minutes as Scott Deasy’s throw in was controlled on his chest by Chris Lyons before the forward volleyed on the turn, but his effort was deflected over the bar. The visitors continued to press though, with Barry again at the centre of play, surging forward before finding Ryan Connolly. Connolly delivered the ball into the box to Eoin McCormack, but the forward couldn’t keep his header down and didn’t trouble Skinner. Galway took the lead on 17 minutes after Gary Shanahan won the ball back deep inside the Drogheda half and delivered into the box, and McCormack headed home into the far corner. Drogheda were forced into making a substitute five minutes later as Conor Kane picked up an injury and was replaced by 17-year-old William Hondermarck. Tim Clancy reshuffled his side, moving Ciaran Kelly to left-back in place of the injured Kane. Luke Gallagher dropped into Kelly’s centre-half spot and Hondermarck Gallagher’s place in midfield. Galway took advantage of Drogheda’s disorganisation as Conor Barry beat several players, made his way into the box, and saw his strike deflect off Kevin Farragher and beat Skinner. Drogheda’s best play of the first 45 came towards the end of the half as Lyons took the ball to the line, cut back to Duffy but he saw his effort saved comfortably at the near post by Ryan. Drogheda came out a different side in the second half with Duffy going close twice in the first five minutes of the half. The first came from a corner, which was blocked, and the second hit over the bar after a scramble in the box following a free kick. The Boynesiders got back in the game seven minutes after the break as Duffy beat three men, made space and picked out Doyle on the left, who set himself and fired past Tadgh Ryan into the far corner. Drogheda were level just five minutes later when Robbie Williams fouled Lyons on the edge of the box and Brennan stepped up to curl a 20-yard free kick past a large Galway wall into the far corner past Ryan. Lyons went close to completing the Drogheda comeback with 13 minutes to play as he controlled the ball in the box on his chest and took it around his man but saw his shot blocked by Robbie Williams. Galway found a second wind and had three chances in five minutes as they looked to claim all three points late on. The first came through patient build up on the left, with the ball played out to Barry on the edge of the box, but his effort took a deflection and went out for a corner. Three minutes later, Carlton Ubaezuono cut in from the left and had his shot blocked. And with five minutes left, McCormack was played in on goal, one-on-one with Skinner but saw his effort saved by the feet of the Drogheda keeper. Drogheda had one chance to win it themselves in the final minutes of added time as Richie Purdy’s 25-yard free kick forced a great save out of Ryan before referee Adriano Reale blew the final whistle. Drogheda United: Paul Skinner; Colm Deasy, Kevin Farragher, Ciaran Kelly, Conor Kane (William Hondermarck 22); Richie Purdy, Luke Gallagher, Sean Brennan (C) (Kealan Dillon 89); Lee Duffy, Chris Lyons, Mark Doyle. Subs not used: Malachy Doyle (GK), Lloyd Buckley, Sean Cronin, Eoin McPhillips, Rob Manley. Booked: Kevin Farragher (62), Lee Duffy (78). Galway United: Tadhg Ryan; Chris Horgan, Robbie Williams, Stephen Walsh, Marc Ludden; Alex Byrne, Alan Murphy (Danny Furlong 70), Gary Shanahan (Carlton Ubaezuono 50), Ryan Connolly (C), Conor Barry; Eoin McCormack. Subs not used: Conor Gleeson (GK), Aaron Conway, Evan Coyne, Evan Murphy, Adam Rooney. Extratime.ie Player of the Match: Conor Barry (Galway United).